There are so many people who seem to think it is ‘kewl’ to attack the police and make all sorts of ridiculously generalised adverse claims about them, I think I have to try to balance this out when possible. While I’m not going to suggest they’re perfect (especially the two ‘kids’ they gave a ‘Traffic Car’ to, and who tried to fit me up for dangerous driving one evening, then drink driving when that failed), too many supposedly shocking incidents that make the media can often be shown to be ‘passive aggressive provocation’ by those complaining. I briefly noted the provision of ‘Trauma Teddies’ some time ago (to be deployed in cases where children were suffering trauma and needed to be comforted), and they’ve turned up again, as this story tells of the donation of a supply of such bears in Dumfries. Nearly 150 trauma teddies knitted by members of the Church of Scotland will help police soothe distressed children. A group of around 40 knitters from Caerlaverock Kirk, near Dumfries, and St Mary’s-Greyfriars’ Church, in Dumfries, made the bright and colourful bears following a suggestion from minister, Rev David Logan. The former police officer asked people to make them two months ago following a conversation with community police officer, Jaclyn Irving, about what the church could do to help the force. Knitting patterns were made available by children’s charity, Children 1st, which is encouraging people across the country to make the bears for Police Scotland. Rev Logan said: “Trauma teddies have captured the imagination of people within my congregations who were more than enthusiastic about knitting them. “I was in the police for 30 years and we did not have trauma teddies – we certainly could have used them. The media often seems all too happy to concentrate on bad news, so it’s good to see a story like this reaching the public. I see a number of police offices have issued appeals for teddies, so the idea is catching on, and is one that deserves support. I remember the ‘Good Old Days’ – days when you could see police/ambulance congregating in a street, get home, look at the news, and find out what you’d been lucky to miss by not being there a few minutes earlier. Now that we live in the days of supposedly ‘instant news’ I seem to find that this no longer works, and I have to go dig for such stuff, if it ever even gets mentioned. I came home last night, expecting to see something online about some incident in Bridgeton that had closed off a street with two police cars, and two ambulances in conference between them, and, even today, the local female population leaning out of their windows saying meaningful things to one another (but not able to be heard at street level). About the only useful thing I learned from this incident is how busy this apparently quiet street actually as, as an endless stream of cars tried to get along it, but had to back out. It was surprising to see how fast a reasonable backlog built up. But mention online in media? Nope. Hidden behind a sign for the Police ‘Lost & Found Property’ office in Glasgow’s Saltmarket is the building that once served as Glasgow’s mortuary, and the original carved ‘MORTUARY’ sign as well. I noticed the white sign while passing some time ago, and realised I’d lost my chance of getting a pic with the ‘MORTUARY’ sign over the door visible. I did some digging, and it seems I was just a little too late to manage this. I note that one of our fine, upstanding, and highly reputable rags managed to jump up and down a few years ago, and criticise the police for spending £350,000 to convert the former mortuary into a lost property store. The place has a grim history. In its day, post mortems of victims of notorious serial killers Bible John and Peter Manuel would have been carried out there. Facing Glasgow’s Saltmarket and Glasgow Green, it was also once the scene of public hangings. The new lost property office seems to date from around 2014, after the old mortuary has been mothballed and replaced by a new facility located at the Southern General Hospital. I found an ‘Equality Impact Assessment’ document online, and this stated that mortuary services moved to the Southern in 2012, and noted that there was storage there for 300 bodies. It also noted that three entrances are provided, one for paediatric cases, one for adult cases, and one for fiscal cases. This is another catch that reminds me I probably have some earlier views of the same building locked away in my pre-digital film collection, and is yet another hint that I really must sit down and digitise it one day. Mentioned above, the victims of Peter Manuel. Such mentions always give me a chill – my mother once walked along the road beside Manuel, fortunately just two people passing by chance, and not when he was out hunting. 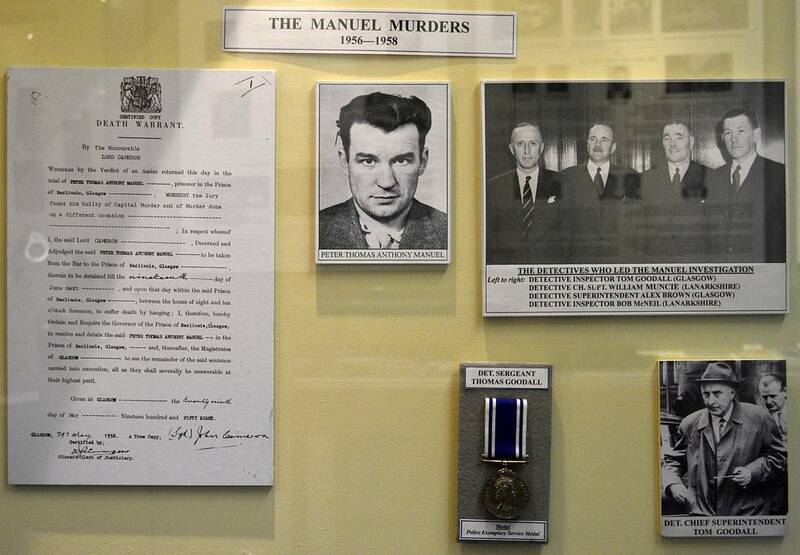 If you visit the Glasgow Police Museum in Bell Street, or have a look at its web site, you will find they have an exhibit featuring Manuel’s death warrant, and the story. Click the pic below to make it a bot bigger. It’s hard to describe how bright the lights around this van parked in George Square were. It’s not the first van I’ve spotted with bright LEDs tacked on, there was another nearby, but it had a reason, being a lorry-sized recovery vehicle (and at work, trying to get a dead bus off the road). In ‘my day’ it didn’t take much by way of alteration to find the police paying attention, yet there seem to be quite a few highly visible vehicles pootling around Glasgow, with lighting which clearly does not comply with any vehicle or mounting regulations, will not carry any conformity marking, and are dazzling. (I’m not making that complaint about this one, just noting it). There was a time when daring to have any blue lights on your car would earn you a ‘pull’ and maybe even court, accused of attempting to impersonate a police vehicle. I recall an early case where one lad ended up with this problem merely for having illuminated washer jets on his bonnet, since they lit up blue. Now it seems this is ignored, which seems a bit odd, given that a look at the news from the past year will show that there are now actual cases where criminals have fitted blue lights with the intent of impersonating police to force drivers to stop, on quiet roads, where they are then assaulted and robbed. Again, be clear this is NOT directed at this bit of car (or van) spotting, which just reminded of some other things. I think it’s shame we’ve ‘advanced’ to the stage where customising is now largely sneered on in this country. There’s a sad irony (for me at least) as I watch the development of drones (and arguing about the meaning of that word makes no difference, language changes to meet the needs of the day, get over it), having been a radio-control modeller in the past. For pure fun, I jumped in with both feet almost the first day serious electric buggies arrived, starting with completely sealed waterproof ‘go anywhere’ chassis (which was soon stripped down to almost nothing as I didn’t go anywhere wet), that I probably doubled the intended speed of, and advanced to a 4-wheel drive beast with differentials, and souped-up with high power motor, extra cells to increase the drive voltage, and electronic speed control to dump the mechanical thing that came in the box. Sadly for the maker’s good efforts, I made it 2-wheel drive, as drifting it was a LOT more fun. Then I got hooked on the start of decent radio-control helicopters, but that never went really well, as I was forever suffering technical issues that meant more time on the ground than in the air, but I did learn the basics, and never crashed. The irony is that in those days, RC helis cost way more than drones, and did not fly themselves in any way. We were lucky to have one gyro, compared to the multiples fitted to drones. Cost and ability kept the sky clear in those days. Today, drones are relatively cheap (a fraction of the original RC helis) and need no skill to fly. But they do need common-sense – and sadly, that’s a rare commodity. Look no further than the issues around increasingly powerful laser pointers. Is the instance of morons who think it is a ‘Good idea’ to park themselves near an airport rare to nil? Sadly, looking at the news and incident reports, anything but! The same people can go out and buy any drone they like, and fly it where they like. I could waffle on about ‘Why we can’t have nice things”. I could list many items I am not allowed to buy, or even OWN for that matter, having been restricted by legislation in recent years. I could probably even point out that relatively responsible (such as me) are restricted by the law, while criminals care not one jot about the law, and carry on unaffected, fairly safe in the knowledge that they will not be caught. That’s not my imagination or an unjustified claim. Look at gun crime for example, or even vehicle excise duty evasion, now growing even though it should be easier to catch offenders by number plate recognition, as opposed to eyeballing ‘tax discs’. I can’t afford a decent drone, so this has no impact on me now. But it’s just such a shame that what should be both a fun recreational item AND a superb tool for serious users, has become demonised and targeted by legislation that is really more ‘knee-jerk’ (to keep uneducated members of the public appeased) than effective regulation. There’s also a clear media trend – maybe intentional, maybe not – to ‘talk up’ stories about civil incidents involving passenger aircraft. This usually comprises a story about a ‘ near miss’ involving a drone a few feet from the aircraft, and reports of drones being spotted by aircrew, often at extreme distance, and so far (despite the number of claims/reports) no actual collisions, or even video to support the stories. There’s been more evidence of UFOs near aircraft than drones. That’s not to be misrepresented as my wanting to see such an event, but evidence and fact would be better. As it is, these sighting have about as much credibility as UFO sightings, which aircrew generally stopped reporting once their bosses began to drop their names off the promotion ladder. I’m just having a bit of a waffle, since I’ve largely avoided throwing anything into this particular pie. But most of the so-called ‘power’ are largely contained in existing CAA rules, and sadly, from comments that can be found in other forums, those currently ignoring those are unlikely to change their habits, especially as they can disappear long before any police with ‘powers’ can arrive. Fly safe if you’re lucky enough to get a serious drone for Christmas. Or maybe not – I like a low profile. But that doesn’t mean I don’t suffer from as much curiosity as anyone else, and I often wonder just why some stops are made on the road. On the other hand, many apparently random stops are based on other information, and these days with almost (but not quite) live info on VED, insurance, and MOTs being available in-car (not forgetting ANPR watching for dodgy registrations as well as the MKI eyeballs), it’s a brave or foolish driver who knowingly ventures out if not relatively squeaky clean. So far, I’ve not seen anyone take off and try to do a runner when the ‘blues and two’ fire up. And I’ll include myself in that, after being shocked to find myself being ‘fitted up’ for a fictitious driving offence within sight of my own front door as I returned home one evening. Thinking an ambulance wanted to pass on our fairly narrow road I just slotted into the first available space between parked cars, only to be surprised when it pulled in behind me. I hadn’t even thought of a big white BMW police cruiser, and couldn’t see it anyway, until the blinding main beams were turned off. We see quite a few ambulances and fire engines, using our road as a feed between two main roads at each end. As it was, I ended up being questioned about some fantasy manoeuvre I had supposedly carried out at the little roundabout on our road (seriously, I had no idea what this little kid with a big BMW was on about – I was just ambling towards my house, 150 metres from the roundabout, and he was accusing me of virtually going around a tiny roundabout virtually on two wheels). During this sham, he noticed a laptop on the passenger seat and started asking about it. Instead, he decided he had witnessed events which gave him grounds to breathalyse me. Needless to say, THAT came up with a big fat ZERO! Today, I’d grab the video and the camera – but I was so shaken at the thought that bar having GPS toys onboard (I was using it all the time back then) and not being a drinker of any sort, I’d been selected as the target for a couple of young cops, and they could have done it too. Their word against mine. If I went to court and challenged them – who’s the Sheriff going to believe? I didn’t even have the presence of mind to take their registration number, let alone their shoulder numbers. They certainly appeared genuine – but I’ve never seen such a car/team camped out in my road, before… or since. An illegal getting pulled? Surely not? I didn’t notice it in this random pic I collected one day, but it looks as if I might be proved wrong (on one occasion at least) and our Scottish Police DO pay attention and give illegal registration plates a pull (just not perhaps as enthusiastically as their cousins down south, as seen on Police Interceptors etc) – assuming this driver was not doing something else. Since this was just a ‘snap’ it missed the full registration number, so all we know is that it was ‘4 NNX’ – but illegally spaced to read ‘ 4NN X#. Cough up and buy a legit personalised registration like the rest of us – and don’t cheat by buying a cheap one and fiddling with it like that (and making life harder for us). In what might be referred as ‘the good old days’ (and by that I mean only a few years ago), it was fairly easy to identify which of the services a vehicle belonged to simply by looking at the colour of the beacons attached to it. Police, fire, and ambulances generally had blue lights; doctors had green, the police seemed to get alternating red at some point. There could also be yellow, on working vehicles that could be a hazard, such as slow-moving refuse lorries, tow-trucks, and various road maintenance vehicles. While many still sport the common incandescent light fittings, with coloured lenses which convert the white light from the conventional bulb behind, newer fitting are manufactured using LEDs, which do no usually have tinted lenses or covers. The end result is that it’s no longer easy to tell what service an unmarked vehicle belongs to just by looking at the auxiliary lights. All you see when they are not energised is a clear fitting, and the colour only becomes apparent when they are activated. Case in point was the Audi I tripped over recently. Roof mounted light bar, but… transparent housing. I couldn’t see any markings or other equipment(eg radio) fitted to it, or lying on the seats, nor anything screwed to the bodywork. There were no cameras mounted anywhere, nor a second rear-view mirror. The same anonymity was true of the driver, inside the adjacent ‘greasy spoon’ and collecting a large bag of goodies to help him survive the rest of the day. Dressed in black, he did have any kit, or badges apparent. There were no lights in the rear window (not even pop-up types), but I spotted a dash-mounted temporary unit, probably blue/red, and a look at the front suggests a small pair of non-Audi ‘white’ squares in the lower grille, which I suspect are LEDs.